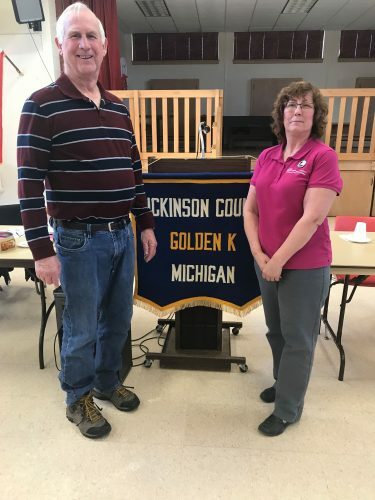 Sharon Scholke, chairperson and Gary Proudfit, Golden K member, teamed up to present the program at the last Golden K meeting. Kingsford — April Fools’ Day one can usually expect to be a party to some fun antics. As the Golden K met on Monday, it was obvious this day would prove to be different. Alice Derwinski on piano teamed up with director Margaret Trudell — together they got the group singing about “April Showers” and “Cruising Down the River.” Some positive and rather hopeful thoughts about spring. Nothing stands in the way of these seniors — rain, snow, or cold doesn’t prevent them from getting their week started on a lively note. Carrying on the “team work,” Don Pedo shared the Happy Dollar Thoughts, which included hooray for Michigan State. Jeannine Polkinghorn did her share by winning the 50-50 drawing and Tom Bugni was satisfied with enjoying all the birthday wishes. Welcoming guest Steve Nelson was Sharon Scholke, chairperson. She teamed up with Gary Proudfit and they presented the program for the day. Teamwork plays an important role in many ways during one’s lifetime. Scholke and Proudfit had stories to share about military experiences, both with Navy backgrounds. Scholke’s husband, Donald, was part of the crew on the Baltimore. This ship was the flagship of the fleet paying respects to the new Queen of Britain Elizabeth, during her coronation week. As the fleet consisted of many British ships, as well as ships from all over the world, this was quite an honor for this heavy cruiser — the Baltimore. There was a week of celebration during which the crew of the Baltimore was invited to “high tea.” Now picture a large “boat” of 18-year-old sailors joining the queen for “high tea.” This was a memorable experience that may have been appreciated more later in their lives. Scholke shared many pictures of the incident showing and naming each ship that was present. 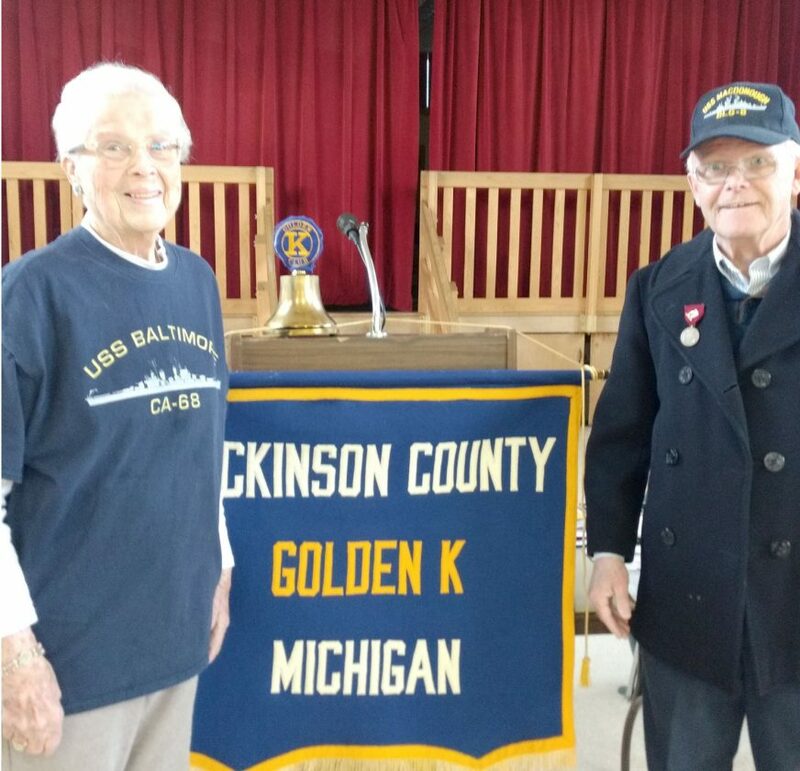 Proudly sharing stories of incidents that occurred during Donald’s time of duty, she treasurers all the memories of their life together and was happy to share them with Golden K members. One of her daughters followed her father’s footsteps joining the Navy and spending 20 years of service, sailing on many ships and making her own military memories. Proudfit presented a slideshow along with his narration. Starting out at the encouragement of his father, who at the direction of his mother, suggested he shape up or ship out. He chose to ship out. Joining the Navy, getting his training in the Great Lakes Naval Station in Illinois, his first assignment as crew member was on the USS Hartley DE 1029 sub chaser. Later he transferred to the USS Macdonough DLG 8, a Farragut-class guided missile destroyer. He also attended the Norfolk, Va., School for Basic Electricity and Electronics Training. He related numerous experiences throughout many countries. Each one comes with its own story, included being stationed at sea prepared to pick up John Glenn if he landed close to their ship. He landed 20 miles down range from them. However, they did see the space craft when it came down. Proudfit was involved with the Cuban Blockade — he sailed to Haiti, Santa Domingo, and Italy. The crew experienced people in their everyday life under a dictatorship. Seeing how things are in other countries gives one a profound sense of appreciation of this country. Not always knowing or being informed of where you are going or why is how the military works. Military personnel do not ask questions they just do what the orders say and remain prepared. There is also a time for sightseeing. Memories are built on these times and friendships are developed that last a lifetime. Both Scholke and Proudfit have enjoyed many a reunion with their respected Naval families. Both answered many questions from a very appreciative audience. The Golden K meeting for Monday will have Kristin Sommerfeld from DICSA. She will update the group on the “Meals on Wheels” program and other issues that DICSA deals with daily. All are welcome. 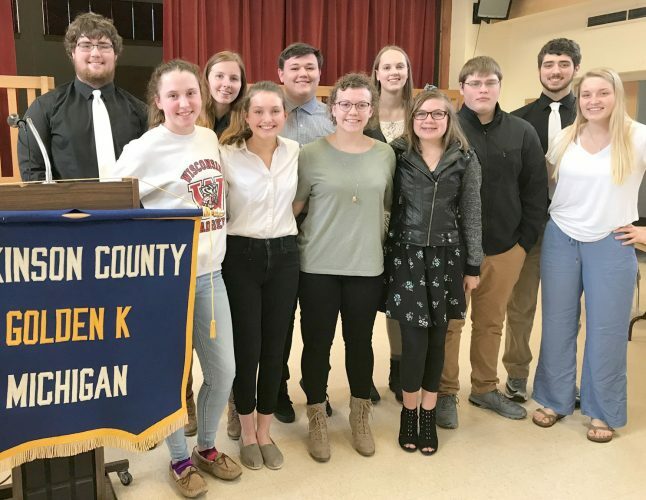 The Golden Throats will sing Wednesday at ManorCare.